This time of year I love baking with spices. You know cinnamon, ginger, nutmeg, cloves, and cardamom. I love this combination of spices in baked goods. There is something about the smell of these spices that is just plain comforting. Maybe it has something to do with the cooler weather or maybe it makes me think of the holidays that are right around the corner. This is where these caramelized banana topped spice cake come in. I normally would put a nice cream cheese frosting on a cake like this, but this time around I felt like changing things up a bit. I like trying different combinations of ingredients to see how they are together and how they taste. 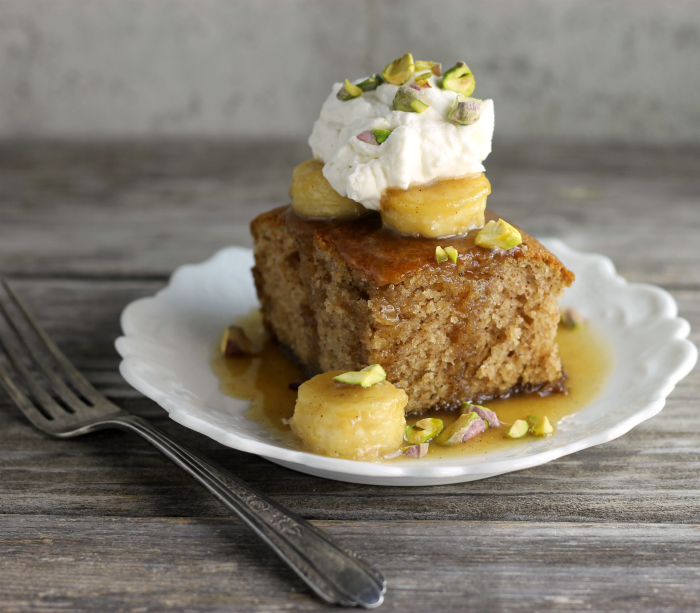 Bananas and spice cake turn out to be a combination that works well together. When I decided to make the caramelized bananas, I had decided to serve them over yogurt. I saw a recipe in a magazine that our local grocery store hands out for caramelized oranges served with Greek yogurt, I was really impressed with the pictures. The pictures were gorgeous. I decided to create my own recipe using bananas and serve it over yogurt as they did. But the pictures were not working for me. The Greek yogurt just didn’t want to stay in place. Oh, but for the record the caramelized bananas and Greek yogurt thing is delicious! So I racked my brain to come up with something that would work for me and this is where the spice cake comes in. 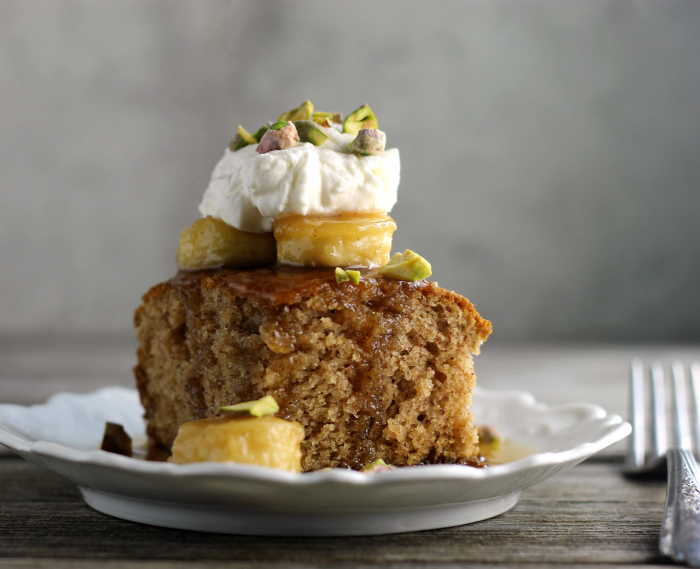 A moist spice cake that is covered with caramelized bananas that are in a sweet caramel sauce, a dessert that you will be happy to serve for any occasion. Looking for something that is not your typical spice cake? 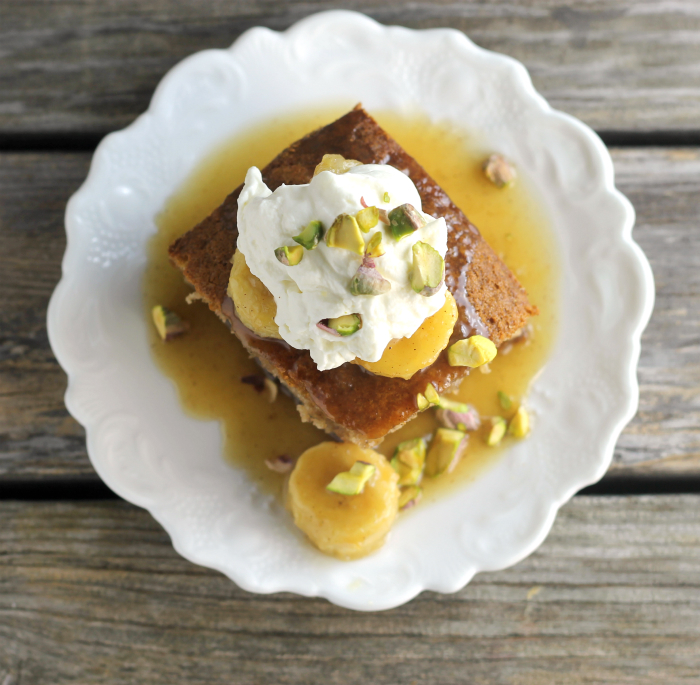 Try this caramelized banana topped spice cake, you won’t be sorry! If you like this recipe check out this one. I always love spiced cakes during the winter season. This looks marvelous, Dawn. 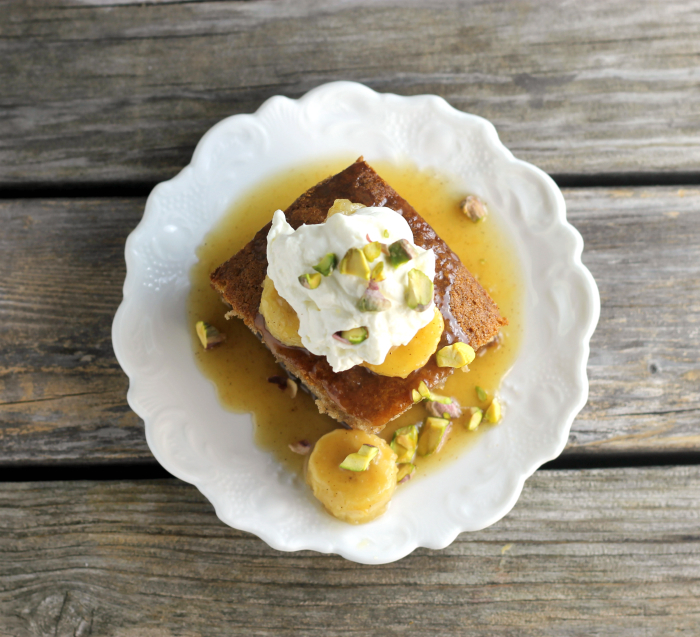 I love the idea use banana caramelized for this spice cake of you! I also love banana too much! I like to decor the cup of ice cream with sliced banana and even I eat them with soy sauce in the style of some Asian people I have acquaintence! Your decor style is so good! Have to try this recipe out.